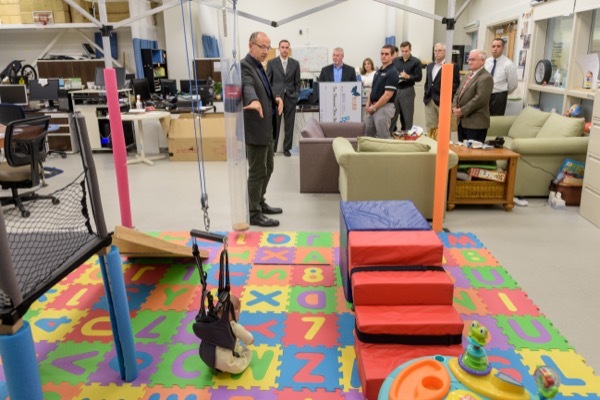 The Pediatric Mobility Lab on UD's STAR Campus uses technology, rehabilitation, engineering and even fashion to provide people with real-world mobility. Pictured are (from left) Cole Galloway (UD), Mike Smith (UD), John Horne (Independence Prosthetics) and Nic DeCaire (Fusion Fitness). 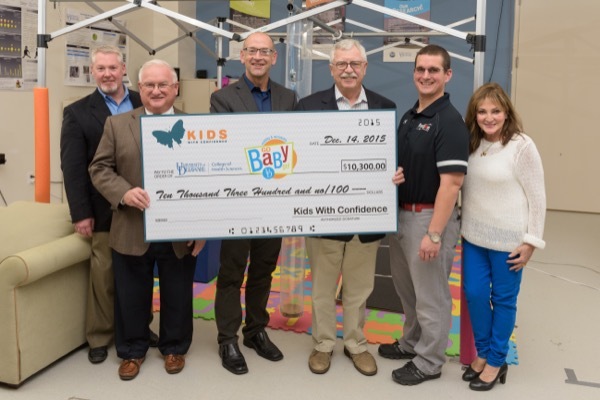 Cole Galloway discusses how the Kids with Confidence donation will help infuse Go Baby Go's research into real-word environments. The Kids with Confidence board of directors poses with UD's Cole Galloway. Cole Galloway is looking for a family with a baby under nine months of age with Down syndrome to participate in the harness system study. 9:08 a.m., Dec. 18, 2015--A donation from Kids with Confidence will give a local child the gift of mobility in 2016. 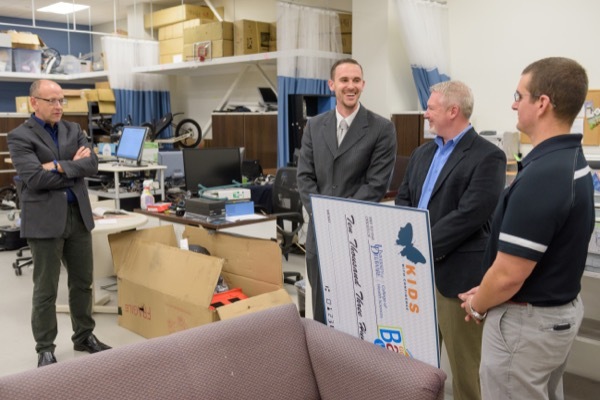 With the bright and energetic Pediatric Mobility Laboratory as a backdrop, the organization’s board members presented a literal “big check” to the University of Delaware’s Go Baby Go project, which uses technology, rehabilitation, engineering and even fashion to provide young people with real-world mobility. 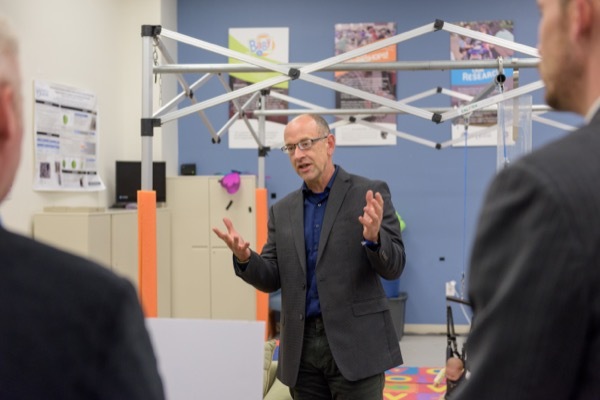 With the mission of providing children with disabilities greater self-assurance, Kids with Confidence recognized an instant connection to the UD program led by Cole Galloway, professor of physical therapy in the College of Health Sciences. The funds go directly toward improving the life of a local child. 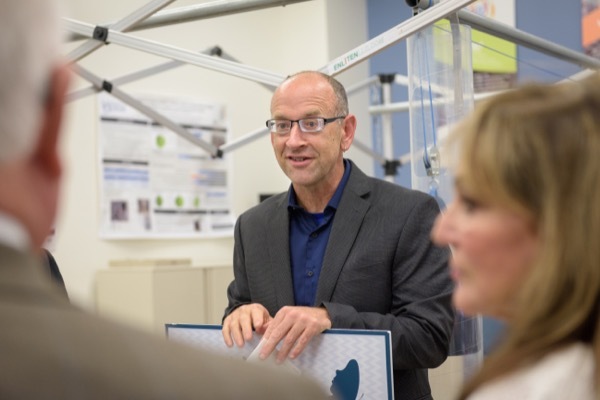 Galloway will station a 10- by 10-foot pediatric mobility harness system, like the one in the UD Science, Technology and Advanced Research (STAR) Campus lab, into a local home. Body weight support harness systems are common in clinics, but Galloway will infuse it into real-word environments. Flanked by GoPro cameras to capture the child’s development, the in-home harnesses will allow the baby to “co-create” a new world at home, providing a better understanding of how technology can improve the lives of those with mobility issues. As Galloway explains, the family-researcher relationship in this project is a twist on the typical academic research study. Family willing to host researchers in their home. Interested families can contact Galloway at jacgallo@udel.edu. This research will ultimately provide information to improve the lives of children with many kinds of mobility and learning issues, but those with Down syndrome are the focus of this initial Go Baby Go research. “We envision a day very soon when a child with Down syndrome will begin to walk within the first year of life,” Galloway says. Future work will feature similar harness systems in multiple homes, as well as community spaces like schools and playgrounds. This harness system is the first of many across the country. With the University’s STAR Campus as the research hub, Go Baby Go chapters from Florida to Oregon will recruit families to participate. The benefit to babies and children is clear, but the application of harness research doesn’t stop when the diapers come off. Galloway has grand plans of harness-based communities of homes, restaurants, fitness clubs and work places of all kinds similar to the STAR Campus’ Go Baby Go Café.